Our money is on the LGBTQ community. They’ve got the moral high ground. The horror in Orlando – 49 people murdered with an assault weapon – was a hate crime perpetrated against gay people. Conservative efforts to shift blame and label the massacre an act of political terrorism have been discredited. Right-wing religious bigotry combined with easy access to rapid fire weapons designed for war drove the deadly Orlando rampage. Over the past few decades, the LGBTQ rainbow coalition has amassed a lot of political power in the fight for tolerance and equal rights. Progress has been made, and the world is better for it. The massacre in Orlando makes clear that much remains to be done. 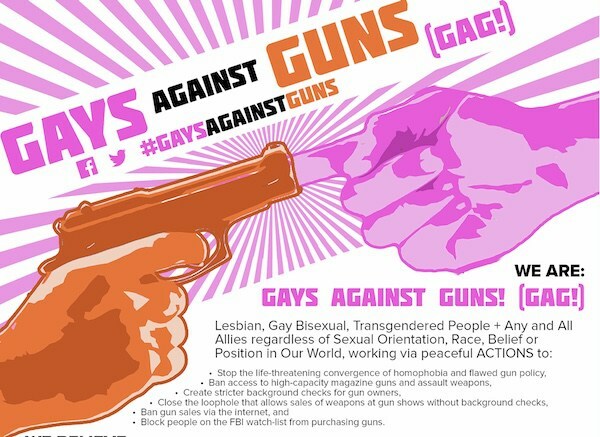 It now appears the rainbow coalition is preparing to take a stand against the gun lobby and the National Rifle Association, a political organization, whose only purpose is to protect the profitability of the gun industry. The gun lobby falsely claims that any effort to regulate guns undermines the Constitution’s 2nd Amendment, which guarantees a citizen’s ‘right to bear arms.’ Of course, that amendment was written 200 years ago, when the only gun one could buy was a single shot, muzzle loading musket. Much has changed. These days anyone, including a suspected terrorist or a mentally disturbed person, can buy a military assault rifle designed to shoot 50 bullets or more in a single minute. As a consequence, gun related massacres have become a part of American life. On an average day in 2015, nearly 40 people were killed by guns in America. In 2015, the number was nearly 13,000 deaths by gun. From 2005 to 2015, 73 people were killed by terrorism on US soil, while 302,000 men, women, and children were killed by gun violence. If the government requires a license and insurance coverage to drive a car on our public roadways, which are well regulated by speed limits and other rules designed to maintain public safety, does it make any sense that guns should be almost entirely unregulated? The plague of gun violence that has loomed over our nation for decades must be stopped. Thus far, the gun lobby has been able to hold off the public’s righteous indignation over the violence in our nation, that is driven by unfettered access to the most lethal guns and ammunition. Orlando awakened a sleeping giant on the issue of gun violence. The Rainbow Coalition has joined the fight for sensible gun regulation. We stand with the LGBTQ community in this fight. Maybe now, finally, when we stand together, the National Rifle Association will lose its cold-blooded grip and be marginalized in favor of sensible gun regulation.